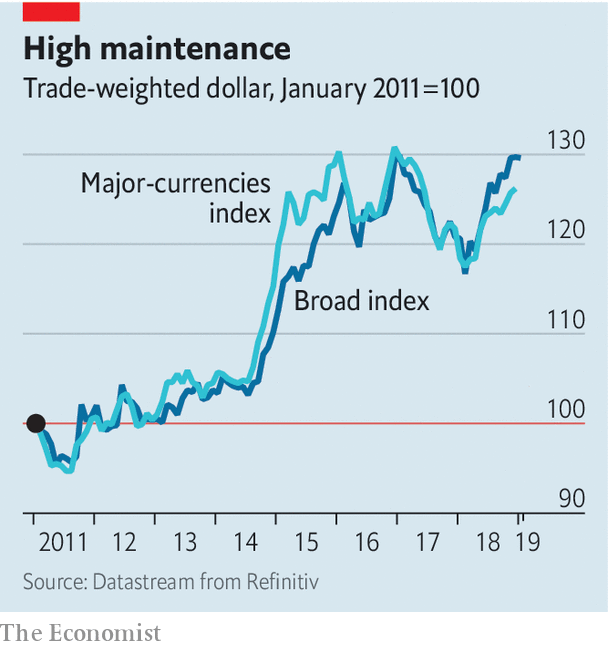 After rising by 7% against a basket of currencies in 2018, where is it headed next? Back at work, investors might usefully apply this aphorism to the fate of the dollar. In a volatile period for financial markets, it rose by 7% against a broad basket of currencies in 2018 and by 4% against a narrower group of rich-country currencies (see chart). One of the more robust principles of foreign-exchange trading is that what goes up must eventually come down. The dollar is over-valued on benchmarks, such as The Economist’s Big Mac Index (see Graphic Detail). It is due a fall. When that is all that is left, the manner of its falling will matter a great deal. The bear case for the dollar is based on an expectation that GDP growth in America will slow markedly. Last year, it was boosted by tax cuts. That stimulus will fade. Interest-rate increases by the Federal Reserve will bite harder. A lower oil price is a factor. It hurts investment in America’s shale regions, but is a boon for oil-importing countries in Asia and Europe. America’s stockmarket is relatively dear. Its tech darlings no longer seem invulnerable. In short, an exceptional period for America’s economy is coming to an end. The dollar ought to lose ground, too. How might that change? Broadly, there are two scenarios. In the first, trade-war clouds begin to disperse. Tax cuts and looser monetary policy in China start to stimulate private-sector spending. That stirs other Asian economies, which in turn bucks up activity in the euro zone, which relies heavily on emerging-market demand. Bond yields rise in the expectation that interest rates will go up in Europe. They fall in America, as traders start to price in rate cuts. The dollar drifts down against the euro. A softish Brexit boosts the pound. Capital is pushed into emerging markets, in search of better returns. Stockmarkets rally, especially outside America. Everyone breathes a sigh of relief. It feels like 2017 again. Achieving fame as the “crown jurist of the Third Reich” does not sound like a good way of endearing yourself to posterity. Indeed, for decades after the defeat of Nazism, the ideas of Carl Schmitt were widely regarded as beyond the pale. But in recent years there has been a global revival of interest in the work of Schmitt, who died in 1985 at the age of 96. Chinese legal scholars, Russian nationalists, the far-right in the US and Germany, as well as the far-left in Britain and France, are all drawing upon the work of the premier legal theorist of Nazi Germany. The resurgence of interest in Schmitt is testimony to a global backlash against liberalism. As the Princeton political theorist Jan-Werner Müller puts it, Schmitt was “the [20th]century’s most brilliant enemy of liberalism”. Schmitt’s hostility to parliamentary democracy, and his support for the power of an authoritarian leader to decide the law, led him down some very dark paths. He issued a legal opinion justifying Hitler’s suspension of democracy and assumption of emergency powers after the Reichstag fire in 1933. And when the Nazis murdered scores of their enemies in the “Night of the Long Knives”, Schmitt wrote a notorious essay justifying the killings. He was also an anti-Semite who called for the expulsion of Jewish academics from Germany and convened a conference on purging German law of Jewish influence. Despite this, contemporary anti-liberals find much to admire in his work. He scorned ideas such as the separation of powers and universal human rights and argued that the distinction between “friend” and “enemy” is fundamental to politics: “Tell me who your enemy is and I will tell you who you are.” To Schmitt, liberal talk of the brotherhood of man was simply hypocrisy. This argument has a particular resonance in modern Germany, where the far-right Alternative for Germany party argues that Chancellor Angela Merkel should have suspended international law on refugees, rather than allowing more than 1m migrants to enter Germany in 2015 and 2016. The Trump administration is considering declaring a limited state of emergency in response to the alleged threat to America’s southern border posed by illegal migrants and refugees. Contemporary Turkey and Egypt provide examples of how the declaration of a state of emergency can be used to suspend legal rights to devastating effect. Alexander Dugin, a Russian nationalist intellectual, has written an essay entitled “Carl Schmitt’s Five Lessons for Russia”. He praises his dicta of “politics above all else” and “let there always be enemies”. And, as a believer in the importance of the Eurasian landmass to Russia’s destiny, Mr Dugin is attracted to Schmitt’s emphasis on “great spaces”, “large geopolitical entities, each of which should be governed by a flexible super state”. Ironically, this was a doctrine that was used to justify the Nazi invasion of Russia, in the search for Lebensraum. But Mr Dugin finds in Schmitt a moral justification for great land empires and “a clear understanding of the enemy facing Europe, Russia and Asia that is the United States of America along with its . . . island ally, England”. However, there are also fringe thinkers in the US and England, who are attracted to Schmitt’s ideas. Richard Spencer, an American white supremacist who coined the term, “alt-right”, has cited Schmitt, along with Nietzsche, as an inspiration. And some on the European radical left have also been attracted by Schmitt’s rejection of liberal attempts to take politics out of the operation of the law or the conduct of economic policy. Ironically, this willingness to debate disagreeable ideas is a hallmark of the very liberalism that Schmitt despised. But the notion that Schmitt’s “trenchant critiques” can be admired separately from his despicable life may be taking liberal tolerance a little too far. Gold Is Up Lately. Why Does It Feel So Disappointing? Since December gold (light blue line) has outperformed the average stock (dark blue) by a nice margin. So why does this feel like such a let-down? Because the stars were aligned for a much bigger move. The structure of the late 2018 futures market had speculators historically short – which normally portends a big price increase. January is also the seasonally best time for gold and silver, since that’s when Asians stock up on jewelry to give at Spring weddings. 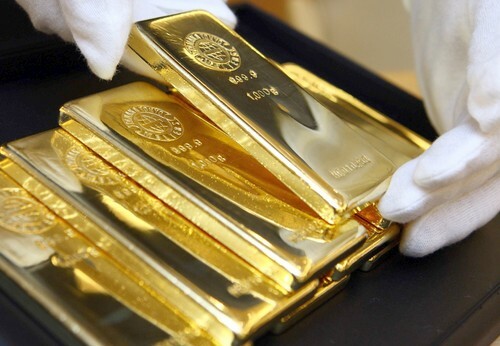 Meanwhile, gold and silver mining stocks had had a brutal 2018 and were poised for at the very least a nice bounce once tax loss selling ended in late December. This was, in short, a set-up resembling early 2016, when precious metals jumped and mining stocks soared. The following chart shows the HUI gold mining stocks index more than doubling in the first ten months of that year. It’s still early in what could yet be a strong first half (before seasonality turns negative and everyone starts saying “sell in May and go away”). And the deeper fundamentals – soaring debt, an ever-more-dovish Fed, insane politics – remain wildly positive for precious metals. So patience is still in order. But jeez, some action would be nice. - Has the market bottomed or is this a dead cat bounce? - Growth sensitive commodities are not as euphoric as the stock market. - Have the growth fears really disappeared already? The S&P 500 (SPY) has now rallied about 10% off the Christmas Eve low as all the fears that caused the sell-off have magically vanished. 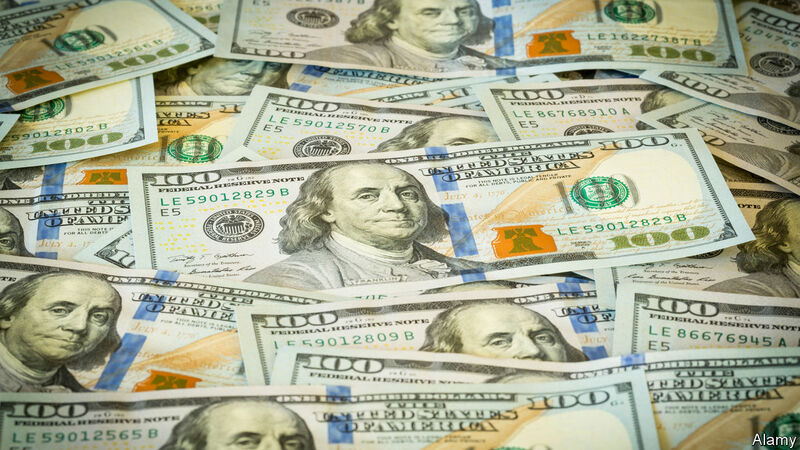 As the market was tumbling, fears of a global economic slowdown (and a domestic slowdown) in addition to a Federal Reserve that had perhaps pushed too far and the sideshow of trade wars and political theatrics pushed the market lower in a seemingly relentless decline. Fast forward roughly two weeks, the S&P 500 is about 10% higher and all of the aforementioned fears are gone as the Federal Reserve members stumble over each other to find out who can capitulate the farthest in the dovish direction. Most Fed members advocated for 2-3 rate hikes this year going back as early as November of 2018. Today, less than two months later, there is a race to see which Fed member can become the most dovish, with consensus shifting towards zero rate hikes this year and a strong likelihood of adjusting or pausing Quantitative Tightening "QT." Tangent aside, the real question we should be asking in regards to this 10% equity market bounce is whether or not this is a dead cat bounce or a bear market rally (or something similar to that) in which a visit of the recent lows is in the cards, or if all the previously mentioned factors that caused the market decline have since gone away and we are back to the bull market. At EPB Macro Research we are uniquely focused on getting the trending direction of global and domestic growth right and not at all worried about trade wars or political theater. Following growth trends allowed us to position defensively in the summer of 2018 and even get short financial sectors such as regional bank ETF (KRE), before a large 30% decline. Investors have a choice regarding this equity rally now that most of the fear is out of the picture. At EPB Macro Research the question can be simplified to growth. Is growth bottoming and starting to re-accelerate? If so, it is certainly time to buy the market. If not, and growth is still decelerating, then this rally will likely fade as the market catches back down to the reality of the underlying growth trends that have not changed. We will take a look at industrial metals for a read on the trends of global growth. Industrial metals provide critical insight into the trending direction of global growth, specifically out of China, one of the world's largest growth engines. A sustained decline in industrial metals is a clear sign that industrial activity has cooled substantially and a leading indicator of slowing growth. One of the industrials metals to watch is copper, or more famously known as Dr. Copper, for the unique ability to diagnose global growth trends. First, looking at the Bloomberg index of industrial metals shows growth is likely still decelerating around the world. In 2014, the industrial metals index was declining rapidly, foreshadowing the economic slowdown to come in late 2015-2016. The industrial metals index bottomed and started to move higher in late December and early January 2016 when the stock market did not bottom until mid-February, a nice lead. While the US stock market did not peak until Q3 of 2018, the global economy and global stock markets started to decline in Q1 of 2018, just after the industrial metals index broadly rolled over and started to signal yet another global slowdown in growth. While the equity market has continued to rally, the industrial metals index has stopped moving higher and actually declined yesterday (Wednesday), a sign that this rally may have more to do with a short-squeeze than a fundamentally driven move higher. The doctor shows a similar long-term path, rising as the global economy accelerated from 2016 through late 2017 and subsequently making a top in early 2018 before declining notably as the global economy decelerated. Industrial metals are saying it is very premature to think this rally in the S&P 500, and risk assets alike has to do with the underlying fundamentals improving. The Federal Reserve has completely capitulated and moved from three rate hikes to zero hikes plus altering QT in a matter of two months. It should be abundantly clear at this point that the Fed is stock market dependent rather than data-dependent. As long as growth continues to decelerate globally and domestically, it is a risky time to buy the market as another large drawdown is likely in that scenario. If growth bottoms and starts to re-accelerate, I will be the first person to start adding equities to the long side as risk-assets love accelerating growth. The trends in industrial metals and Dr. copper more specifically, while just one indicator, firmly suggest that there has been no substantial pick up in growth and this rally in the market is more than likely a bear market bounce as a result of a short-squeeze caused by a dovish capitulation by the Fed. If the market continues to move higher and industrial metals stage a multi-week reversal and move notably higher, I will check the direction of global growth across all indicators and position accordingly. For now, I'd need to see a lot more evidence that things have changed between December and today before getting excited about this 10% bounce after a 20% decline. Bilateral trade statistics tell only part of the story of the Chinese market’s importance to the US economy. In particular, the availability of cheap imported goods from China lowers prices not only for US consumers, especially low- and middle-income families, but also for US businesses, supporting job creation. NEW YORK – China will benefit from a normalization of its trade relationship with the United States, but it is important to realize that the same holds true for the US. When the US tech giant Apple recently slashed its sales forecast, CEO Tim Cook pointed to declining sales in China – where US President Donald Trump’s trade war is exacerbating the effects of a slowing economy – as a major contributing factor. Apple’s diminished performance highlights how important the Chinese market has become to the bottom lines of many US companies – and reveals the risks Trump’s protectionism poses to the American economy. The truth is that Apple sells substantially more iPhones and iPads to the Chinese than US export statistics imply. Likewise, General Motors sells more cars in China than what is recorded in US export data – more, in fact, than in the United States and Canada combined. That is because these companies, like many others, operate in China and sell directly to Chinese consumers. Far fewer Chinese companies sell directly in the US. Because US companies have increased their operations within China over time, bilateral trade statistics only partly reflect the Chinese market’s importance to the US economy. From 2000 to 2018, US exports to China soared by 530% – far more than the 130% cumulative growth of US exports to the world as a whole. This was a direct result of the considerable and unilateral trade liberalization China has pursued after joining the World Trade Organization in 2001, including reducing its applied tariff rate from 30% before WTO accession to less than 6% today. Furthermore, approximately half of the imports into China are subject to zero tariffs if production is for the world market. China’s rapid GDP growth boosted imports, but that growth was also facilitated by trade liberalization and other pro-market reforms. No country has dismantled more barriers to trade or undertaken more pro-market reforms than China over the last four decades. China’s market-oriented reforms unleashed a wave of entrepreneurship and enabled private-sector firms – both domestic and foreign-owned – to thrive and, in many cases, to achieve faster growth than state-owned firms. This contrasts sharply with the narrative being pushed by some that China has largely ignored or evaded the commitments it made when joining the WTO. If that were true, China simply could not have managed to grow faster than 95% of the world’s countries since 2001. Some argue that, even if US businesses have profited from their access to the Chinese market, US-China trade hurts American workers whose jobs are exposed to low-wage competition from Chinese workers. But the availability of cheap imported goods from China lowers prices not only for US consumers, especially low- and middle-income families, but also for US businesses, supporting job creation. Nearly 40% of US imports from China are parts and components and intermediate inputs. The cost savings these imports bring to US businesses help to boost their competitiveness, enabling them to hire more workers. According to my research with colleagues, this supply-chain effect creates more jobs than direct competition from China eliminates. While the lost jobs are concentrated in a subset of manufacturing sectors, the jobs gained from trading with China are spread throughout the economy, including many modern service sectors. Thanks to this job-creation effect, US trade with China benefits 75% of American workers, even before accounting for the positive effect on their purchasing power and before any income transfer from winners to losers. Nonetheless, many in the US continue to focus solely on the potential role of open trade in fueling job losses. When a US firm lays off workers, trade with China is frequently blamed. But when a US firm hires more workers, one seldom hears about the cheaper Chinese inputs that made it possible. 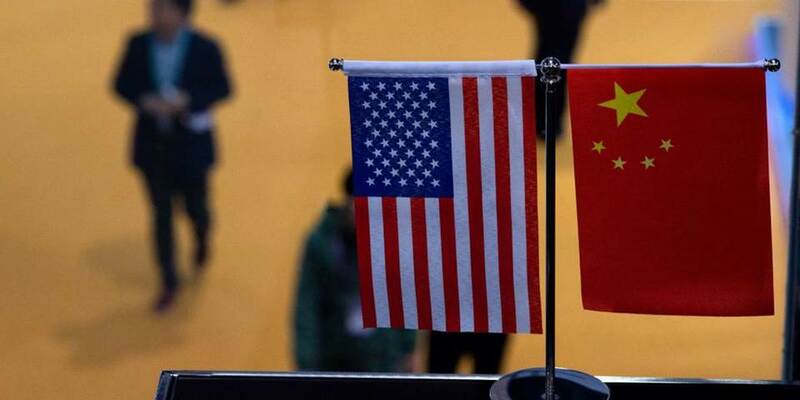 Some in the US are calling for a decoupling of the US and Chinese economies. If that happens, US companies using Chinese inputs would lose competitiveness relative to their European and Japanese counterparts, the workers they employ could lose their jobs, and living standards for low- and middle-income US households would suffer as prices for many goods rise. None of this is to say that China should not be making changes. It should work to lower trade barriers further, reduce subsidies to state-owned firms, relax restrictions on foreign firms operating in the country, and strengthen intellectual property rights. But if bilateral trade is to be fairer and more efficient, the US needs to make some changes as well. For example, it should reduce high tariffs (often in the 20% range) on textiles and garments, a major category of Chinese exports. And it should reform its anti-dumping regime (by merging it with the antitrust regime) and change unfair rules that, by imputing the production costs of other higher-cost countries to Chinese production, put Chinese exporters at an artificial disadvantage. Both the US and China gain from normalizing bilateral trade relations. While policy reform is difficult anywhere, owing to political pressures and vested interests, a reciprocal and balanced approach could be the key to sustained progress in both countries. The question is whether leaders will have the necessary courage and wisdom to put the relationship back on track. Shang-Jin Wei, a former Chief Economist of the Asian Development Bank, is Professor of Chinese Business and Economy and Professor of Finance and Economics at Columbia University.